Finally, the day we have been waiting for. On Friday, the City of L.A. released the draft short-term rental ordinance. At first glance, we are encouraged by the ordinance language. It is clear that the City staff took the time to listen to all the stakeholders and move forward with the intent of the original motion introduced by Councilmembers Bonin and Wesson. We have worked hard over the past several months to build a strong coalition of neighborhoods that have been negatively impacted by short-term rentals and this long-awaited draft ordinance includes the elements we were most concerned about. The ordinance holds the rental platforms accountable, regulates commercial operators by finding a way to identify primary residences, and most importantly, protects our vital affordable housing. We look forward to the ongoing dialogue as the conversation continues and the ordinance is finalized. We continue to be concerned about enforcement. We know that the best ordinance will do no good if the City is unable to enforce it. We are preparing for a big fight with Airbnb and the other platforms. They do not like this draft so we are gearing up to combat their efforts to water down the ordinance in the coming weeks. Please keep your eye on our facebook and twitter pages, this website, and emails for calls to action! We are frustrated! Every day that the City of Los Angeles delays the release of the report on short-term rental regulations, more and more affordable housing units are being taken off the market. Greedy landlords are converting rent stabilized units into short-term rentals and wreaking havok on our neighborhoods. We recently joined some allies in urging the City to act quickly in this joint letter. As you are probably aware, the Department of City Planning will release their report regarding short-term rentals any day now. It is imperative that we keep beating the drum, and make sure that the City Council hears what we want and need on this issue! Over the past few months, KNF has been working hard to educate City Hall about the need to protect the RSO housing in our neighborhoods. We have met with every single City Council office, and told them the stories about how vulnerable tenants are being unlawfully evicted just to have their building converted into short-term rentals. Families are out on the streets, and landlords are cashing in. This needs to stop. We have been working closely with some of the biggest affordable housing non-profits in Los Angeles to push the needle forward on this issue – Coalition for Economic Survival (CES), SAJE, Thai Community Development Center, POWER, and Venice Community Housing to name a few. They have sent letters urging City Council to protect L.A.’s already limited affordable housing stock and prohibit the short-term rental of RSO units. Read letters from CES, Thai Community Development Center, and SAJE. We have also been successful in pushing our message in the local media with Op-Eds in the Daily News and the Argonaut newspapers. Although we have made much progress, there is still a lot of important work left to be done. Thank you for your support, and we will be in touch soon with information about how you can participate in the next round of public hearings. Last week the Hotel & Lodging Association released a report saying what we already know: commercial short-term rental operators are running rampant in Los Angeles. Residents of rent-controlled housing units are being forced out of their homes. Angelinos who value living in a community where people care about and look out for each other should cringe at the rise of these commercial operators who abuse and game the system to invite strangers into our neighborhoods and then pocket the proceeds. These commercial landlords are jeopardizing the character and safety of our communities, but, even worse, they are fueling LA’s housing crisis by encouraging landlords to convert affordable and rent-stabilized apartments into hotel rooms, thus decreasing the available housing stock and driving rent prices up. This is not home sharing – this is home stealing. This new report shows that what we are experiencing all around the City is real. Why are short-term rentals ruining neighborhoods? The story is really the same all over the country—and the world. Neighbors are seeing their communities fractioned, with different visitors moving in and out every few days. The sense of security—or knowing your neighbors—is being eroded and long-term renting neighbors are being forced out of their homes so that greedy landlords can add more units to the STR market. As the article explains, neighbors in New Orleans are turning against one another. The City has implemented restrictions on STRs, but officials have admitted that there are not resources for enforcement. This is another great example that Los Angeles can learn from as it works on its own regulations. We have to be able to enforce any new rules and protect our neighborhoods. Perhaps no other area of Los Angeles is feeling the intense negative impacts of the short-term rental industry more than Westside communities. Many of us have experienced partying vacationers disrupting our streets and impeding safety. It’s no understatement to say they are everywhere. Loud visitors who have no regard for the sanctity of our homes and communities have replaced formerly stable streets filled with neighbors we could trust and rely on. Perhaps even more alarming is that money-hungry landlords are victimizing our longtime neighbors. Young tenants are being intimidated. Senior citizens are being harassed until they agree to relocate. Tenants who have lived in their homes for decades are being forced to wait weeks for repairs. Why? Because landlords can make thousands of dollars more per month by offering an apartment as a short-term rental, and many are doing whatever they can to vacate residents. Los Angeles is losing many homes once protected under the city’s Rent Stabilization Ordinance. In Venice in particular, it seems like virtually every apartment complex is involved with short-term rentals in some capacity. Many RSO building have been completely cleared out of long-term tenants and are essentially operating as de-facto hotels. Some landlords are allowing units to sit vacant in order to convert each empty unit into a short-term rental. Remaining tenants face a loss of community, security and, in some cases, available parking. They sit and watch as empty units are upgraded to attract tourists, while their own units sit in disrepair — leading them to eventually give in and move out. Landlords are evading the city’s rent-control regulations to unfairly cash in on higher nightly rates. Just recently, local media reported a story of two Hollywood residents that had been wrongfully evicted, only to have their units later listed on Airbnb for use as short-term rentals. While these tenants are suing the landlord, we at Keep Neighborhoods First know of many other landlords who are doing the same thing and facing zero repercussions. Meanwhile, the Los Angeles region is grappling with a severe housing shortage. It is heartbreaking to see affordable housing units taken off the market and converted to short-term rentals by greedy landlords. We love having visitors in our beach communities. Tourism is one of our biggest economic stimulators, and the increase in illegal de-facto hotels — some of them being purchased by overseas owners —shows that tourism is booming on the Westside. Do we need additional hotel rooms to accommodate visitors? Perhaps. But let’s study that and create a legal process for moving forward. We must find a balance between tourists’ access to beach communities and the loss of long-term rental housing that threatens community character and cohesion. Keep Neighborhoods First was formed to protect our neighbors and neighborhoods from abuses. We are working to influence the regulations currently being proposed in Los Angeles. Specifically, we hope city leaders will enact short-term rental regulations that are comprehensive and enforceable. To get the job done, local government must work with hosts and rental platforms. We are calling for an online registration system that would allow hosts to provide information needed for enforcement, but the city will also need the rental platforms to require that all their hosts register with the city. Finally, we believe that only a home’s primary residents should be allowed to offer short-term rentals, with a firm prohibition against landlords converting rent-controlled units into short-term rentals. As similar discussions take place all over the world, Keep Neighborhoods First will continue the fight until the city of Los Angeles adopts regulations that shelter renters from abuses and protect the integrity of our communities. We are counting on our leaders to do this right. This post also appeared on Argonaut News. 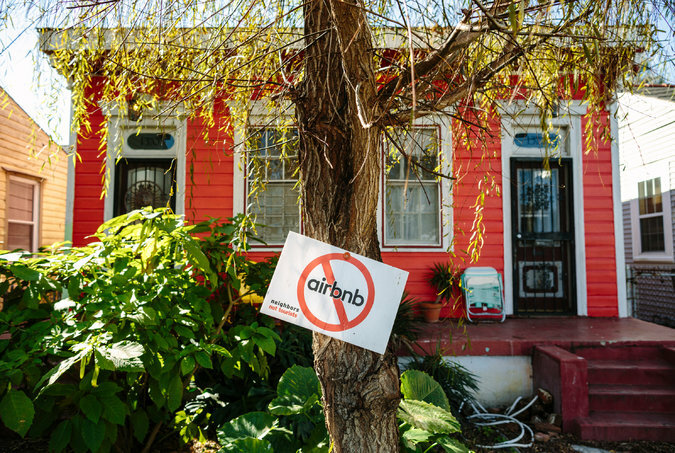 Not long ago, AirBnB and other short-term vacation rental supporters touted Austin, Texas as a good example of how to regulate short-term rentals. We wonder how they are feeling now that Austin is moving toward banning all STRs in the City? As cities all of the world are looking at how to regulate the STR industry—it is important that they look at the success and failure of other cities that were early adopters of regulation. There are good lessons to learn. The City of Austin had allowed some short-term rentals for people that were actually sharing their homes—meaning that they were also at the home when visitors stayed. However, the City’s affordable housing shortage was exacerbated by short-term rentals—much like what is happening in Los Angeles. Now, all STRs will be phased out in Austin. In our own backyards, Santa Monica passed restrictions that were just impossible to enforce. Airbnb and other platforms virtually ignored the new rules. Hence, the city seems to be moving toward tightening regulations. And in New York, Airbnb pledged to cooperate and provide data. However, they recently admitted to removing more than 1500 units from the platform prior to releasing the data. AirBnB admitted to removing 1,500 listings from its platform that were controlled by commercial operators to paint a rosier picture of its operations. AirBnB is now also admitting that nearly 40% of its revenue from whole-home listings comes from hosts listing multiple residential properties for short- term rentals. And many of the listings that were scrubbed are now back online. This shows that we cannot trust platforms to self-regulate and control the abuse that will inevitably occur. Solving the negative impacts of STRs is not easy. It is going to take a lot of work. We hope Los Angeles is learning for other cities and ensures that any new regulations protect rent-controlled housing and hold the platform accountable for transparency. The Department of City Planning report says that the Mello Act requires the City to do two things: Preserve and create affordable housing. This is right, but incomplete. There's a very important third thing required under the Mello Act: that residential uses in the Coastal Zone cannot be changed unless very strict conditions are met. Keep Neighborhoods First is very concerned with the widespread, un-permitted conversion of residential housing into AirBnB-type short-term rentals / hotels, and Venice is ground-zero. We've seen approximately 2,000 units converted without permits. Within the Coastal Zone, the Mello Act would help us preserve our valuable residential housing stock at a whole range of affordability levels, and will help us reclaim our residential neighborhoods. Conversions to hotels or STR's cannot be permitted on residential sites according to the Mello Act. As we do the important work of creating and preserving affordable housing, please do not lose sight of the Mello Act's prohibition on converting any residential uses to non-residential uses that are not Coastal Dependent, such as a hotel. We are waiting with anticipation for the Planning Department report to come out. But, we remain concerned about a key item—enforceability. The short-term rentals that are proliferating all over Los Angeles are already illegal. And KNF has been frustrated at the lack of enforcement from the City. Staff seems to be pretending to enforce – the common excuse is that there is just not enough evidence—regardless of the fact that stakeholders have followed City instructions and rented units (in rent controlled residentially zoned apartment buildings) and provided pages and pages of proof, including the evidence of short-term rental contracts and receipts. What about any new ordinance leads us to believe it will be enforced? We are hopeful, of course. But a good way to help ensure enforceability would be for the new ordinance to require assistance from all of the various platforms. Most importantly, any new ordinance would only allow primary homes (one per family unit/person) that have been registered with the City to be listed/advertised on any platform. Without this cooperation from the platforms, any new ordinance will be more of the same. We hope the city gets the right. For now, we continue to encourage all stakeholders to get involved and have your voice heard. If you have short-term rentals in your neighborhood, you can report them to us here and let the city know by emailing Jeff Paxton. We are looking forward to the release of the draft ordinance and report for the City of Los Angeles’ Planning Department. KNF has been fighting, mobilizing, and lobbying to ensure that Los Angles is a leader in the region, and passes the first comprehensive and enforceable short-term rental ordinance in California! We have learned so much from other cities that have gotten it wrong, like San Francisco. We are working with housing advocates to ensure that affordable housing is protected with any new rules. We will keep you updated as new updates arise, but we expect to need your help very soon. Sharing this letter we received from a local housing advocate.